It’s been a long time since I posted about The Last Musketeer. But there have been some exciting developments since then. 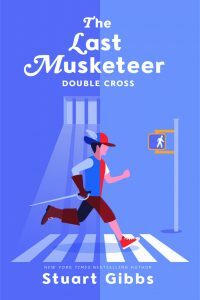 For those of you who are unaware of what The Last Musketeer even is, it’s a trilogy I wrote back in 2011-12 about a modern day kid named Greg Rich who gets transported back to Paris 400 years ago, where he ends up bringing together the Three Musketeers for their first adventure — and becoming the infamous D’Artagnan. For the past few years, it has been relatively hard to get these books — and the second two in the series were never even released in paperback. And if you prefer audiobooks, the series will soon be available that way too. If you have never had the chance to read this series, here it is! It’s full of adventure, swashbuckling, mystery and humor. I’ve always been proud of this series (my son used to claim it was his favorite of mine) so I hope you check it out. 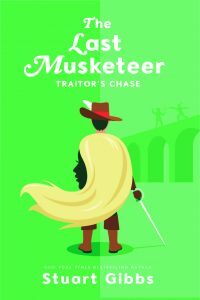 You can start by getting The Last Musketeer by clicking here. Wow! These covers look amazing! Who designed them? Since this is a different publisher, I’m guessing Lucy Cummins didn’t design it. Personally, the Last Musketeer series is my favorite Stuart Gibbs series and it was pretty sad to me that it wasn’t getting anywhere near the appreciation it deserves. Hopefully, that is due to change now that it is being re-released. The new covers are a major improvement from the older ones, even though they do look a little more childish. Anyway, this is great news! Also, was this series republished by Simon and Schuster, or another publisher brand? They look great! This is my fav of your series! You’re right, Lucy did not do these. The cover art was done by Patrick George, while the design was done by David Curtis. 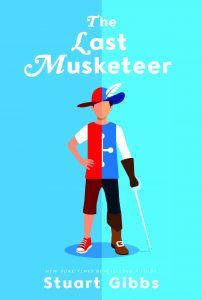 Last Musketeer was published by Harper Collins and they are behind the new versions as well. The last comment wasn’t from me. Do you really have to be such a jerk? I mean, how low could you get bro? Interesting. A modernly cover. I like that. But personally, I like the other ones better. It reflects the time period better in which the story is set. Hmm. So then how can we bo so sure who is the real and fake Elite? Real Elite, don’t you now write your name with a 1 instead of an l? I prefer to just use this name for the website. Plus, whenever I try to use anything else it doesn’t let me publish the comment for some reason. Also, ask me a question that only the real elite z would know. That way, if I am the fake elite z, then the real elite z won’t respond and therefore, you will know if this is the real or the fake elite z.
I haven’t read these books in a million years, but isn’t it “D’Artagnan” instead of “D’Artagnon”, which was in the second paragraph of your post. Wow, I love these covers! Stu- i just finished the series today of the last musketeer today. Could you just tell me what would have happened later on if you would a fourth book. To the real Elite Z what is the real Elite Zs fav book? Sorry I meant Elite Z favorite Stuart Gibbs book? I don’t know. There wasn’t really much point to me thinking about a fourth book in that series. I am very busy. But I still respond to these myself. Do you happen to know your MBTI personality type? Anyone noticed that for the cover of the last musketeer, Greg has his sword in his left hand, as well as the glove. However, for the other two books, his sword and glove are in his right hand? Doesn’t really matter much but. You know. Why not? I do not even know what an MTBI personality is. I’m not 100% sure whose face it is, but I would guess it’s supposed to be Milady’s. I tryed your quiz, I got Logician INTP – T! My favorite book isn’t probably the Lord of the rings return of the king ( the other two are really good too tho). Cool, I am INTP-A so we are very similar. Cool. I am INTP-A so we are very similar. My favorite book is probably Lord of The Rings Return of the King (The Fellowship of The Rings and The Two Towers are really good too though). Sorry. The first out of my latest 3 messages showed as though it didn’t send so I resent it. I reloaded the page and realized that I said the same thing twice. Wow. I just noticed that on the Traitor’s Chase cover, Greg’s cloak is also part of someone’s face. That’s cool. Does anyone know who actually is the FAKE Elite Z is? Its anyones guess I bet one of the last five comments or all of them were from the fake Elite Z. This whole real and fake elite z thing is really getting out of hand. The last post that the fake elite z made was when he said someone’s copying my name. Ever since, all the comments where from the real elite z (me). I have been doing my best to keep the fake from posting any more. Thanks! Also, did you take the MBTI test that I shared? To the real Elite Z- if you can’t get him to stop just change your name. I would highly recommend that you take it. It is very accurate and after taking it, it gives you an elaborate description of your type. It really got me by surprise of how accurate it was. It kind of feels like someone is reading your mind and telling you what they see. Nice update to your website. 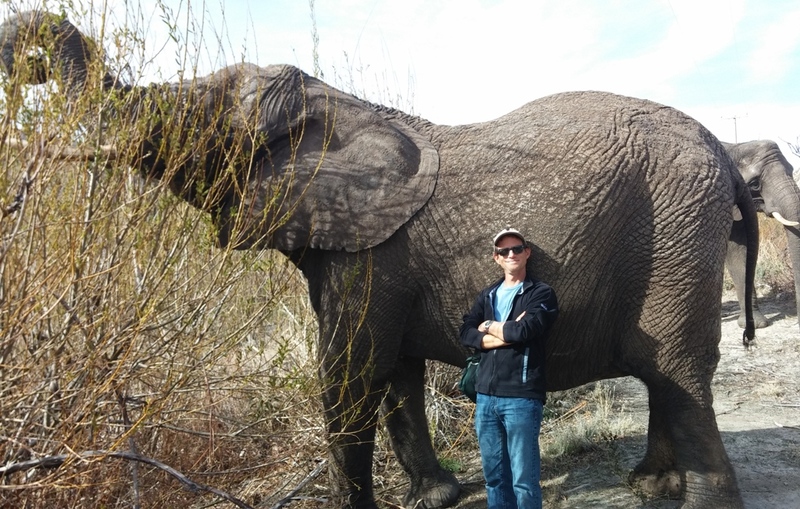 I am pretty excited about getting Lion Down. I’ve come up with a fun challenge for all you code breakers out there. I am a regular user on this website. However, I have encoded my regular username. See if you can solve the code!